What is the point of communicating if we do not understand each other? Are we just talking to ourselves and our partner is watching the conversation? Literally. And we are talking “at” each other? Being understood by our partner is necessary in order to build a bond and to build trust. Building trust is not only about being honest with each other, trust is further established by feeling safe in talking with your partner, knowing that it is an honest and open dialogue, and feeling that we can talk about anything and be understood. This creates more of a desire to talk more to each other. It makes talking so much easier. We may not say it often enough, but being misunderstood is hurtful. We are talking, but we fail to communicate to the point of where we are actually connecting. The problem is not totally about the lack of communication. 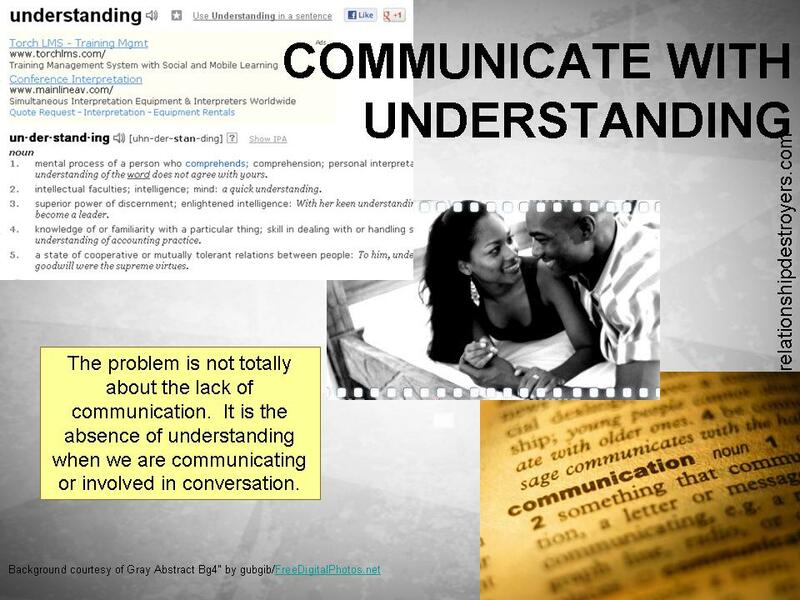 It is the absence of understanding when we are communicating or involved in conversation. We must listen in order to understand. In order to listen we must pause everything— our thought, feelings and our words. While we are in pause, we are listening to our partner. Listening not only by hearing, but by watching the body language also. And lastly, asking questions to develop further understanding. There are some basic conversational responses that will not be productive during the conversation. They are: Agreeing to everything. (Doing this appears insincere and implies indifference.) Saying the words or anything similar to “Yea, okay, and no problem”. (These words can actually create a problem.) No one wants to be in a conversation with anyone who has nothing to say or nothing to add. Judging. No one opens up to talk to anyone to be judged. (Judgment shuts down a conversation— every time.) These actions are communication barriers. A conversation consists of one person talking and the other is listening. Then the listener responds to what was said and the other person, who was talking before, now becomes the listener. And so forth and so on. Now as the listener, you are not thinking about what to say while you are the listener–you are in listening mode only. Fully present to hear every word. The one who is talking should not only be the one who is speaking— but that person should also be very effective in getting the message across. The listener’s job is to ensure he/she has an understanding of what is being said. The only way to do this is by providing undivided attention, and asking questions to ensure accuracy of the information that is being shared. At some point, it may help to re-emphasize some parts of the conversation in order to ensure as a listener you have understood what you have heard. As the one who is talking, your job is not only just to talk. Your job is to be clear and not vague. What is the point of talking if you are not explaining in a way that the listener can understand? Sometimes, it is okay to solicit thought on what you are saying, like, “Am I making sense?” It is okay to ensure you are being understood. When we are talking to each other, we must listen and speak. Conversation does have an order. Listen and Talk. So, in a conversation, rather than focus on feeling what you have to say is important, and no doubt it is; just be sure to explain in a way that ensures understanding. As a listener, be sure to listen with an understanding. This entry was posted in Actions in Relationship and tagged how to listen to understand your partner, how to understand your partner, understand to build trust, understand your partner, understanding in a relationship. Bookmark the permalink.